- Late Check-out will be charged as an extra day. Rivoli Cinema Hostel was rated among the top five small hostels worldwide at the 2010 and 2011 Hoscars, and it's not hard to see why. Hostelworld guests say 'the location couldn't be better, located in a safe part of downtown, between the metro and the train station, the historical centre and the shopping street, all at a walking distance'. 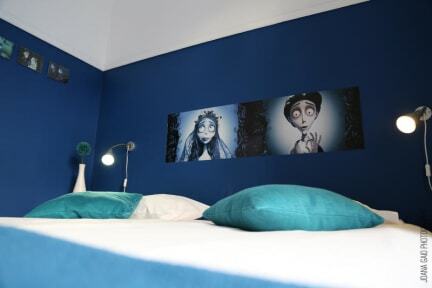 We like the whimsical film decor, especially the Tim Burton rooms. This hostel has a large rooftop terrace with a swimming pool and BBQ and travellers tell us it's 'very easy to mingle and meet people with the pub crawl and free city tour'. We welcome all the backpackers, travellers and guests who search for the unique experience of staying at the first cinema hostel in Portugal, right in the centre of Porto. Enjoy our spacious rooms, the large and well equipped common areas and the exceptional terrace in a prize-winning cinema atmosphere! We offer four-bed dorms and double rooms with shared bathrooms. Rooms include free bed linen and feature free heaters in the winter and free fans in the summer. The dorms have free individual lockers, while the double rooms can use our free safe deposit box. The double rooms come with an optional free baby bed for children up to two years of age. We’ve carefully decorated all the common areas and rooms, making you feel at home with your newest big family. You can stay in a room themed after your favourite movie or director – we’ve got Tim Burton, Tarantino, Francis Ford Coppola, Almodovar, Jean-Pierre Jeunet, Godard, Manoel de Oliveira, Spielberg, Ridley Scott, Mira Nair, David Fincher, Stanley Kubrick, Sofia Coppola and more! Our common areas include a fully equipped kitchen, a dining area and a large lounge where you can relax, have a drink, read, play video games on our PlayStation and Wii or watch satellite TV or one of our 300 DVDs. If you prefer to be outside, we have an outstanding 150m² terrace where you can sunbath, BBQ, listen to music, party or just socialise with the others guests. Our renovated facilities, 24hr availability, cinema theme and friendly multilingual staff create an especially cosy and comfortable atmosphere. We have free Wi-Fi, free internet, free maps and travel advice, free walking tours and free luggage storage on arrival and departure. Don’t forget our free continental breakfast and all-day coffee and tea! Towels are available to rent for €2 and we also have a €6 wash-and-dry laundry service. Car parking is available for €9 per day. We’re set in a 1930s Art Deco-style building, full of character itself. It was designed by Eng. Francisco Xavier Esteves, the same designer as for the amazing Lello Bookshop (considered the third most beautiful in the world), to serve as his family home. Although it preserves the charm of most original elements, it was carefully renovated to provide you high standards comfortable accommodation with updated infrastructure. We’re the best located hostel in Porto. We’re right in the Aliados neighbourhood in Porto’s historical centre, where you can find streets full of monuments, restaurants, cafés, esplanades, shops, supermarkets and touristic info. We’re just next door to the metro (underground/tube), train, bus, taxis and historical tram. From the 1st of March 2018 the City of Porto charges a Touristic Tax of 2€ per person and per night. Guests under the age of 13 or with disabilities are exempt of this tax. All reservation made after the 1st of March of 2018 are subject to the tax. I stayed in a private room and it was very clean. Great place to stay with friendly and helpful staff. The codfish casserole like dish for one of their dinner nights was amazing! really good one！ locker is safe. Facilities are clean. Comfortable stay. The staff was exceptionally helpful giving us directions, support and ideas. Wonderful hostel. Excellent hostel! Perfect location, staff super friendly, breakfast was very good, super clean, good lockable lockers, wifi was awesome, have nothing to fault at all with this hostel! Rivoli Cinema Hostel was great! The location was perfect and the staff was very helpful! Loved staying here and would definitely stay again! Awesome staff, facilities and location! The hostel is really nice and the staff is really helpful. After we checked out, we had a night flight and they allowed us to spend some time at the hostel until our flight. Kitchen and kitchen utensils are convenient all the time and you can grab a bite at any time, because the hostel offers some free food and drink. Hostel location is perfect and has a great breakfast! The outlets are limited and not near top bunks in the rooms. The bathrooms are also mixed gender - not a big problem, but just so people aren't surprised. Great security overall as well! Great location and a very comfy and inviting common room and kitchen. Rooms and beds are basic and yes, you'll have to unplug your lamp to charge your phone and it doesn't reach the top bunk. Only found 3 toilets/showers for the floor but it was ok (off season), and the bathrooms were always clean. Would suggest some recycling bins but otherwise a v nice stay. I think our hostel is perfect for guests travelling alone or in small groups of friends because, thanks to our huge indoor and outdoor common areas, it's really easy to make new friends here. It's also perfect for couples because of the romantic cinema-themed double rooms. We're just next to the main city square, Aliados, and all the major historical attractions are less than five minutes' walk from here. I particularly recommend cisiting the Lello Bookshop, considered one of the top three most beautiful in the world and designed by the same architect as our building. We've got tons of freebies, like our Wi-Fi, breakfast, walking tours, summertime swimming pool and much more.